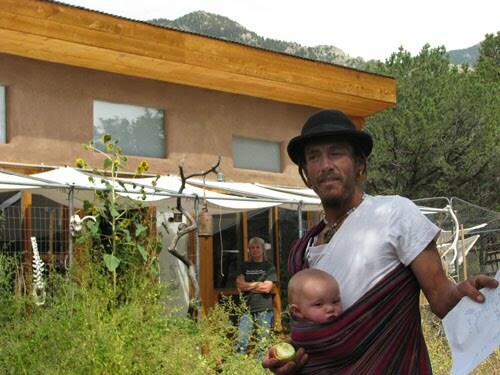 Kelly Hart has been involved with green building concepts for much of his life. He has also worked in various fields of communication media, including still photography, cinematography, animation, video production and now website development. 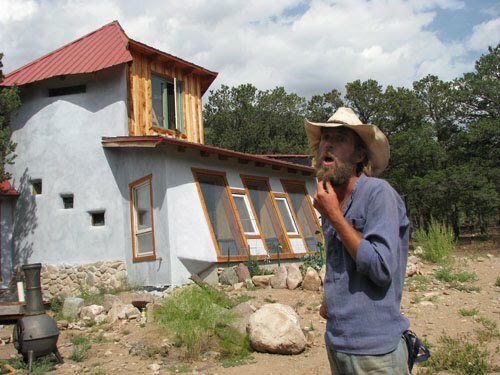 Kelly has lived in an earthbag/papercrete home that he built and consults about sustainable building design. 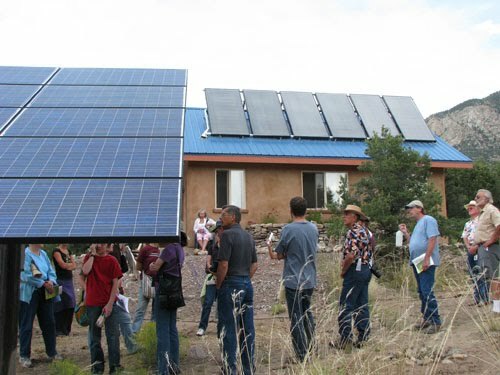 This year’s Twentieth Annual San Luis Valley Energy Fair held in Crestone, Colorado featured three different concurrent homes tours on a Sunday afternoon. It was hard to decide which tour to take, since they all were intriguing. Ultimately the impulse toward simplicity and sustainability won out and I chose to join the walking tour in Crestone to avoid driving and to get some more exercise. 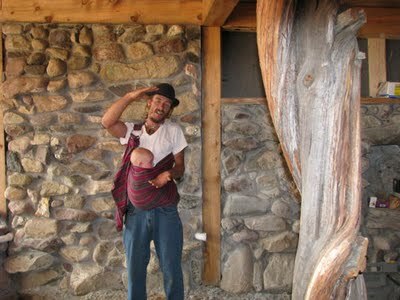 We met our tour leader, Jeremiah, at Crestone’s Town Park and hiked the few blocks to visit Carmin’s passive solar strawbale home. I remember going over her evolving plans several times with her as she approached the actual building phase. I’m sure that this planning has paid off for her, since there is very little that she would change about the house. 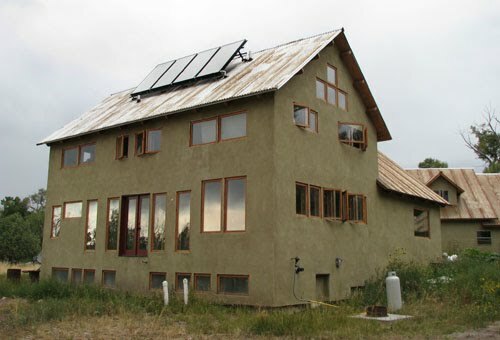 The passive solar aspect has been most rewarding, in that the average floor temperature during the winter has remained at 65 degrees F. This means that she only really needs supplemental heat during periods of gray days. In fact, she says that the upper clerestory windows provide too much direct sun in the winter, so she has added scrim cloth to soften the glare from these windows. One other thing she would do differently is to shed the roof towards the south instead of the north, so that the snow wouldn’t pile up so much, but would melt off instead. A short hike through the woods brought us our next stop: Annie’s new strawbale yoga studio and home. Annie announced that the most sustainable aspect of her place is the location; she and her students can easily walk into town, which eliminates much driving. First we inspected the yoga studio, a lovely, invitingly open space with floating bamboo floors and vaulted ceiling. There is a mechanical room that houses all of the equipment associated with her photovoltaic electrical system and the active solar water and space heating system, which serve both the home and the studio. Solar heated water is pumped through hydronic tubes embedded in the floors, and these heat the areas above them. The solar water heating panels on the roof of the studio have a drain-back arrangement to avoid freezing problems. Annie’s residence does have some passive solar heat gain, which is augmented by the adobe floors that act as thermal mass. The PV panels are mounted on a pedestal south of the studio, and the rack can be manually repositioned seasonally to optimize their orientation. She has a net-metering arrangement with SLV Rural Electric, so that any excess electricity that is produced will actually run her meter backwards! For backup electricity, in case the power grid goes down, she has a battery bank, but this rarely gets used so she expects that batteries will last a very long time. A short walk down the street brought us to the compound where both Jeremiah’s and Adam’s families live. They are proud of the work they have done on the property to advance various aspects of permaculture design, in terms of rain-water catchment and grey water reuse. There is a lovely pond that Jeremiah constructed that collects water that can be used for plants and livestock. Adam’s house is nearly finished after several years of hard work. It is a hybrid structure, consisting of a central core cylinder of strawbale walls with appendages of wood-framed walls. The insulation for the wooden portions is sprayed soy-based foam. Much of the interior plaster is of earthen materials. There is an interestingly designed passive solar greenhouse attachment to the south. Adam admits that his lack of planning for his house has cost him some difficulties with lost time and money. Just up the hill from Adam’s home is Jeremiah’s work-in-progress: a partially underground dwelling that he is building mostly on his own. He started out with having a large hole excavated with a backhoe. Then he carefully sifted through all of the excavated soil and threw the larger stones back into the hole. Next, he constructed a heavy timber-frame supported roof that is covered by thick EPDM waterproof membrane. Originally he was planning to turn this into a green roof, but later decided to fashion it for water catchment instead, so there will be a mat of gravel over the membrane to protect it and help filter the water. The entire southern wall of the home is wood-framed for glass and passive solar heat. The rest of the walls are finished with stonework (using all of the stones that he threw in earlier) as infill between the wood posts. These walls are insulated on the outside with several inches of foam, and then protected with a moisture barrier before being backfilled. A room in the far back will serve as a cool pantry/storage area and the walls here were fashioned like those that the famous $50 underground house book advocates, with wooden slats attached to wooden posts, protected with plastic and then bermed with soil. Jeremiah’s house is likely the most economical of all the houses we toured, since he claims that he will spend under $20,000 for the entire project. 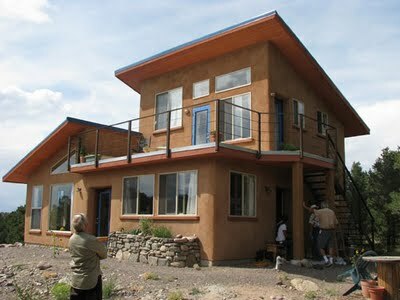 Being substantially underground and rather small, it will also likely be one of the most energy efficient homes. It was threatening rain when we hurried over to Keith’s home, with Jeremiah leading the way on one of his ponies. This is another hand-made labor of love, with Keith doing most of the work. He is obviously a master at timber-frame construction, as the expansive vaulted cathedral ceilings proudly demonstrate. Sandwiched between the massive timbers are thick, home-made structural insulated panels. The roof panels are a full foot thick, constructed of OSB skin with custom TGI ribs and partially soy-based foam (he has his own foaming machine). He claims that these panels provide R-65 insulation, while the thinner wall panels provide R-32. All of this insulation helps hold in the passive solar heat from the southern glass. Most of this glass is not protected from the summer sun with shaded overhangs, but with such a high vaulted interior, overheating in the summer may not be an issue…it was certainly comfortable inside the day we were there. There is a full basement in this house, and some of this space is devoted to the equipment for regulating and distributing both the solar water and solar electric panels on the roof. The rusty color of the roof is intentional: he used tin-core metal roofing that is designed to provide a natural rusty coating, while keeping the metal from corroding all the way through. As we left Keith’s impressive abode, the threatening rain was beginning to materialize, so I scurried along the side of the road to seek shelter in my waiting car. It was an afternoon well-spent, with much camaraderie and learning. I certainly have a better sense of the sustainable wonders that are harbored in unique Crestone.